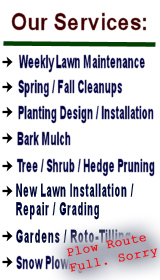 Complete landscape and grounds maintenance services in the Needham, Dover ma and surrounding areas. For over 25 years Wilson Landscape has been providing complete grounds maintenance and landscaping services in the Needham, Dover and surrounding areas. We pride ourselves on the meticulous detail and attention given to each lawn we service. Our services range from simple projects to well manicured estates. We'll gladly custom tailor our landscaping services to fit any budget. Let us service all your landscaping needs. Complete Landscape and Grounds Maintenance, with an edge! We provide more than maintenance, it's maintenance with an edge!. We're very particular about our service. We'll review your property and make suggestions that are not only cost effective but will improve the overall maintainability of your landscape. If you need residential or commercial landscaping or grounds maintenance services, Wilson Landscape will get the job done for you promptly, professionally and at reasonable rates. If your ready to get started please call 781-449-1030 or fill out our estimate form.